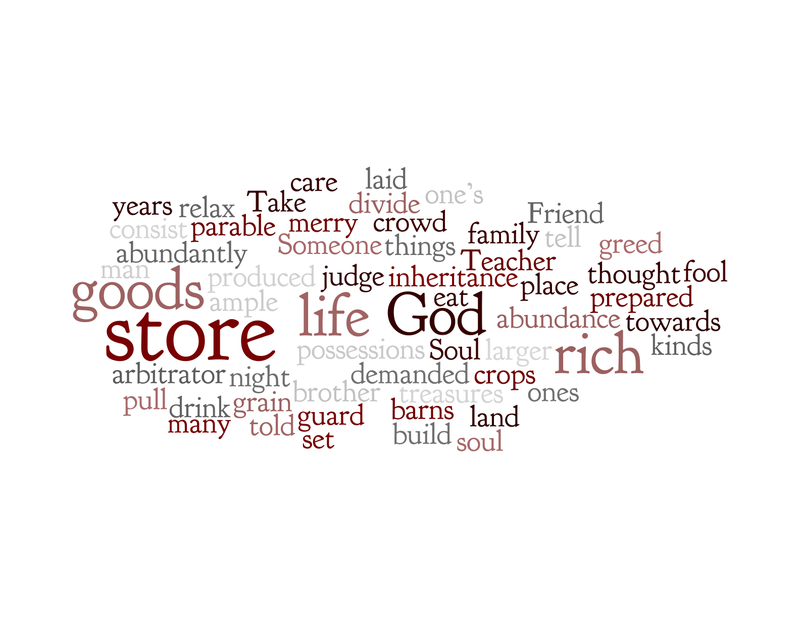 Interesting to note that the key words in this week's wordle are God, rich, life, goods and store. What does it mean to be rich? What riches is Jesus referring to? Wealth? Blessing? Finding the favour of God? Life, don't talk to me about life... Getting the balance right between work and the rest of life is a balancing act to say the least. Trying to squeeze God into that is the norm for many Christians these days. How do I open myself up to allow the richness that God offers to impact my whole life? Goods - something about where our trust ultimately lies? A pointed question to the middle classes/capitalist democracy? Store - where is the richness of God stored for us/in us? In heaven? In our hearts? What are we storing - the treasures of God? Are we storing to save them to be spent by us at the right time, or are they being stored up by us to be spent by God through us, in His time? I found this link - http://www.workingpreacher.org/dear_wp.aspx?article_id=381 - very helpful.